Liquid metal batteries were invented a decade ago, but despite their high energy density and potential they have not yet reached the renewable power industry. Donald Sadoway of Massachusetts Institute of Technology and colleagues have begun the process of commercializing their invention through the startup company, Ambri, but have now also discovered another approach that could make liquid batteries more viable as well as more affordable. Writing in Nature Communications [Sadoway et al., Nature Commun. 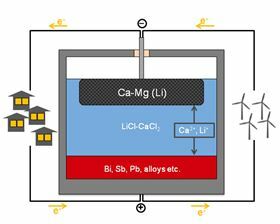 (2016), DOI: 10.1038/ncomms10999] Sadoway, Takanari Ouchi, Hojong Kim and Brian Spatocco demonstrated unexpectedly how the abundant and cheap element calcium can be used for both the negative electrode layer and the molten salt that forms the middle layer of the three-layer battery despite the difficult chemistry and its high melting point. The first key was to alloy the calcium with a second inexpensive metal, magnesium, with which it is usually found in mineral sources anyway, to lower its melting point by about 300 degrees without losing its high-voltage advantages. The second was to reformulate the salt used in the battery's middle layer, the electrolyte, by using a mixture of lithium chloride and calcium chloride, which serendipitously does not readily dissolve the calcium-magnesium alloy. By chance, these two tweaks to the liquid battery setup meant that rather than a single "itinerant ion" passing through the electrolyte, multiple ions contribute to the flow, boosting energy output. This could open up new avenues in battery design, Sadoway suggests, pointing to greater potential for grid-scale electrochemical energy storage. The path forward might also now exploit all of our engineering experience in sustainable power supply, environmental, life cycle, materials, manufacturing cost, and scale-up. Sadoway and Ouchi also stress that this particular chemical combination is not the ultimate setup. Instead, this work represents a starting point for new approaches to liquid battery formulation that might be adapted for particular applications. "The lesson here is to explore different chemistries and be ready for changing market conditions," Sadoway explains. The team has not developed a battery rather a "whole battery field" that could tap the periodic table for improved formulations in the future. It was the obvious difficulties in making calcium work in a liquid battery that attracted Ouchi to the problem. "It was the most difficult chemistry" to make work but had potential benefits due to calcium's low cost as well as its inherent high voltage as a negative electrode. "For me, I'm happiest with whatever is most difficult," he adds. The next step, Sadoway told Materials Today is to, "search for lower melting salts to drive down the operating temperature of the battery."